The Smartvest Smart Alarm Kit by ABUS allows you to tailor the system to your home and offers complete control via an Apple or Android SmartPhone or tablet. Email and push notifications when alarm is triggered. Easy to set up zones and scenarios. Smartvest alarm panel includes an integrated 90 dB siren. Remote keyfob for arming / disarming from any room. Components are pre-linked for a fast and easy DIY install. Alarm will accept up to 32 different components. Connect up to 4 indoor or outdoor IP cameras to view and control via the App. ABUS	The ABUS Smartvest Wireless Alarm is a fully featured burglar alarm system which gives you complete control of your alarm from your Smartphone or Tablet. The alarm kit includes 4 components, but can be expanded to include up to 32 components allowing you to tailor the system to your home. Take a look at what's in the box and the wide range of accessories you can add here. Customise the Smartvest Alarm to suit your home and lifestyle by setting up individual scenarios which allow you to automate actions in your home. ABUS indoor or outdoor IP Cameras can also be fully integrated with the alarm system allowing you to view and record footage via the alarm app. You can choose to set up a scenario where the direction in which the camera records, changes when an alarm trigger is activated. The system is armed or disarmed using the included wireless Keyfob or via the Smartvest Alarm App (available for iOS and Android). When the alarm is triggered a loud internal (90dB) siren will sound to alert others of an intruder and the system will alert you via email and an App notification to your smartphone. The Smart Hub is the heart of the alarm system and is connected by an Ethernet cable (included) to your broadband router. Once connected to your router the hub connects via wi-fi to each device on your alarm system. The detectors should be placed in the corner of rooms that are vulnerable to intruders. When the alarm is armed an infrared sensor will detect any movement and activate the loud external siren. All the wireless components are linked together straight out of the box. There is no technical knowledge or wiring required to install the Abus Smartvest Alarm. The alarm system will notify you by email and push notification if the alarm is triggered. You can access all of the alarm settings and features via the Abus Smartvest App (available for iOS and Android). The system can be activated and deactivated using your SmartPhone and when used in conjunction with Abus IP Cameras, images or video footage captured by the cameras can be viewed on the app. The alarm can be set to create 9 different zones allowing you to arm selected zones. This can be especially useful if you decide to split the upstairs and downstairs of a property into separate zones. While away from the property you would activate all zones and during the night you could activate only the downstairs zones. The Abus Smartvest Alarm is designed to operate on on a frequency of 868MHz which uses a short duty cycle of only 1%. This means that any single device can only transmit for 1% of the time, leaving the channel free 99% of the time. When multiple devices are operating on the same system this technology ensures a more stable connection and little chance of interference. Many DIY alarm systems use a less regulated higher duty cycle reducing performance. 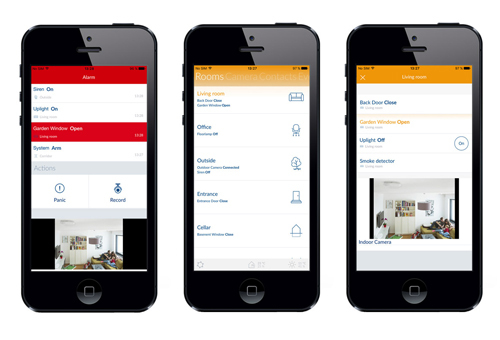 Set up scenarios which allow you to automate certain actions in your home, completely tailored to your requirements. Once an alarm sensor is triggered, such as a door sensor or motion sensor, you could program a power socket to activate or an IP camera to point towards the sensor and start recording footage. * Requirements: This alarm system requires a broadband internet connection with a router that includes one free wired network port. SmartPhone must be iOS 8.0 and above or Android 4.0.3 and above.